Most of the remains of buildings in the Weidelsburg date from about 1380, though there are some more recent additions (mostly 15th century) as well. The castle is a good example for late Medieaval castle architecture with some traces of more modern fortress fortifications. The latest architectural changes were the addition of a set of walls outside the outer curtain walls which left an empty space between both walls, the zwinger (sometimes called outer courtyard) where the enemy would sit in a trap if he managed to breach the outer gates or a part of the wall. A good example of a zwinger can be seen on photos 2 and 3 in this post about Coburg Fortress. In case of the Weidelsburg, not much remains of the southern zwinger. To the north, the outer bailey took that role and was fortified with a series of half towers. The gates were protected by half towers as well. The semi-circular towers protruded out of the wall and had arrows slits at the outside, but were open to the inside, with platforms from which all sorts of interesting things could be thrown or poured onto the enemy who made it into the zwinger. The parapets on the battlements allowed a defense to both sides as well. The arrow slits in the towers and battlements where shaped in a key form to allow the use of the arquebus, an archaic form of muzzle loaded firearm with a matchlock trigger that came in use in the 15th century. The arquebuses were hooked to the slits to soften the recoil and allow for better aiming. The heavy bullets they shot could pierce plate mail at close distance. Both the keep and palas, dating to the late 14th century, could be secured by portcullis and heavy beams. The buildings also had corner oriels to cover the yard with missiles. They are connected by walls and, together with the third northern wall, form a trapezoid shaped inner bailey. The first floors had originally been windowless; the windows were added at a later stage, probably when the outer zwinger walls were built as additional defense. Two gates lead into the outer bailey, the Naumburg Gate and the Ippinghaus Gate. Besides the curtain walls with arrow slits and parapets that point at the use of the bailey as zwinger fortification, it also housed the stables, granaries, the bailiff's quaters (the curtain wall is lower in some part, pointing at a half timbered house once sitting there), and probably a smithy and other workshops. One of the half towers protected a well. The keep was built on a cliff of pillar basalt which continues on the outside. Since no cellar is mentioned, I assume that none was built due to the hard quality of the bedrock. The palas had a double cellar and three storeys. The ground floor was separated into a great hall and an anteroom which may have been used for household works or - as I assume - as the lord's office. The hall has several large crossbar windows to the north (facing the inner bailey), with embrasures and benches. This photo is an addition from our visit in 2016. The first floor held the living quarters of the lord's family and a little chapel; the uppermost floor was again used for observation and defense. There likely were small rooms for the watch, too. The cellar had two storeys as well. The lower one still shows traces of the barrel vaulting and a chimney, therefore it may have been used as kitchen. The other cellar was used for storage. 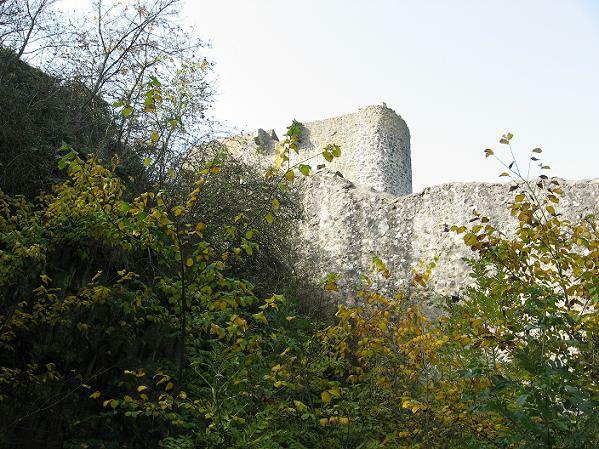 The area outside the castle had been deforested in the Middle Ages to prevent enemies from sneaking up to the castle. There were three additional towers with a palisade connection to the curtain walls. The foundations of one remain. The southern side of the castle was additionally protected by a trench. 1) The information panels are avaliable online here. 2) There is a platform on the roof that allows for a view over the surrounding landscape, but the stairs leading to it are too open for my taste. Muss mal eine beeindruckende Burganlage gewesen sein. Noch eine Burg, die mit auf unsere Burgenwunschliste muss :-)Danke auch für die Links - sehr interessant - speziell auch Coburg. An Burgen herrscht in Deutschland wahrhaftig kein Mangel, liebe Silberdistel. :-) Besonders in den Mittelgebirgen sitzt so ziemlich auf jedem Gipfel eine, wenn auch von manchen nur ein paar bemooste Steine übriggeblieben sind. Die Feste Coburg ist in der Tat beeindruckend, über die sollte ich auch mal einen längeren Post schreiben. Love the interior view of the Eastern keep. Trying to imagine living from day to day inside a stone behemoth. Well, it was not so stony back then: there would have been wooden floors and tapestries on the walls, at least in some parts, and likely cushions on the benches in the window enmbrasures. But those hilltop castles were indeed windy and draughty places.